Fast Ryder #2 from Bulldog Seeds are feminised autoflowering seeds that are originated by crossing the Fast Ryder #1 x Afghan. This weed strain is an almost pure Indica strain. 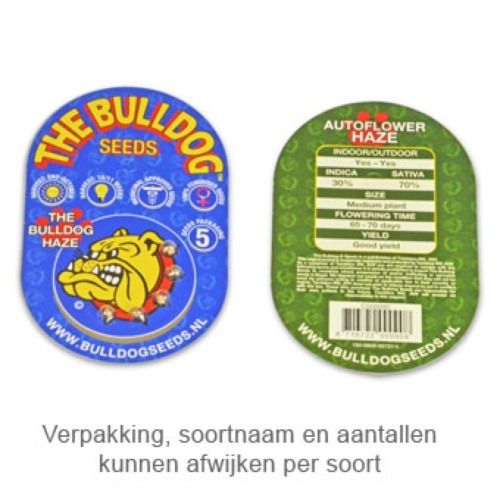 Bulldog Fast Ryder #2 are weed seeds that are appropriate for an indoor grow and outdoor grow. This strain is suitable for growers with less experience because these plants are easy to grow. She is a fast grower and produces a nice yield. The taste is sweet and fruity with some mango elements. The effect of smoking this weed is a prolonged stoned feeling in combination with a relaxed physical feeling. This weed is frequently used as medical cannabis seeds, the exact effect is however unknown to us. Growing cannabis from these feminised autoflowering seeds is not difficult and provide you a very powerful Indica weed. Tell us and our customers what you think of the Fast Ryder #2 from Bulldog Seeds.